What’s the best material for a deck? Asking us which is the best material to use on a deck is a bit like asking us which of our children we like the best – we might have a personal favourite but it’s best left unsaid! When it comes to decking materials, now more than ever there are a multitude of choices. Firstly, and perhaps most widely known, is hardwood, including merbau, ironbark and blackbutt. Hardwood timbers are durable and usually denser than softwood, helping them to withstand the normal wear and tear that decks receive. In addition, they generally have a rich colour and are very attractive. Secondly, there is softwood decking, in particular pine timber decking. Many people believe that softwood is actually soft but it’s not. In fact, the real difference between softwoods and hardwoods is botanical and has nothing to do with toughness of the material. 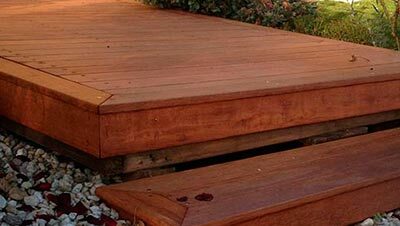 Therefore, a pine deck can be an excellent choice, particularly when budget is a concern. Lastly, there is modwood, a composite material made from a blend of wood fibres and plastic. It looks very much like wood – although some would say not as good as real wood – and performs very well in a deck. 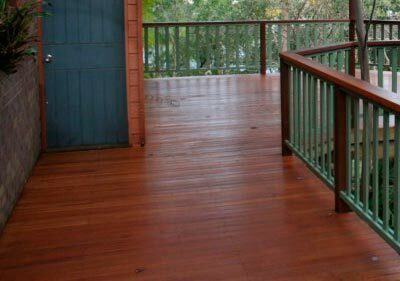 Its big advantage is that it doesn’t need sanding or any sealer, a great benefit if you prefer not to maintain your deck. So which is the best? Just like choosing your favourite child, it’s not easy to answer and the fact is that the best decking material is the one that suits your needs. For example, hardwood is generally darker in colour than softwood and hardwood and softwood both require regular sealing, while modwood doesn’t. As for budget, modwood is generally the most expensive, followed by hardwood and then softwood, however, taking the cost of sealing into account modwood may be better value over the years. Plus, it’s always wise to take into account the materials in the surrounding structures and the surrounding environment when making a decision.